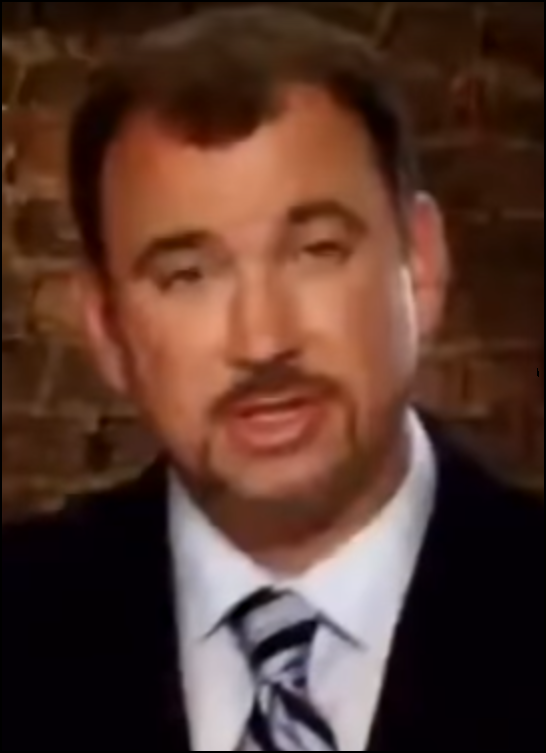 ● Sinaiticus is Not a Forgery: Setting the Stage – in which I provide some background about Constantine Simonides and his career as a criminal forger, and explain why no one should believe James White’s account of how Tischendorf first encountered pages from Codex Sinaiticus. ● Ten Reasons Why Sinaiticus Was Not Made by Simonides – in which I summarize 10 observations which weight in against Simonides’ claim to have written the text in Codex Sinaiticus – including the observations that different copyists (with different handwriting and different standards of spelling) produced the manuscript, and that the manuscript includes in its margin an Arabic note that alludes to an Arab invasion. ● Ten More Reasons Why Sinaiticus Was Not Made by Simonides – in which I summarize 10 more reasons why Simonides’ claim should be rejected – including some details of Simonides’ earlier attempt to use a forgery to defraud the Academy of Berlin. Constantine Tischendorf played a key role in exposing Simonides’ forgery, after which Simonides was arrested. ● What Darkened Sinaiticus? 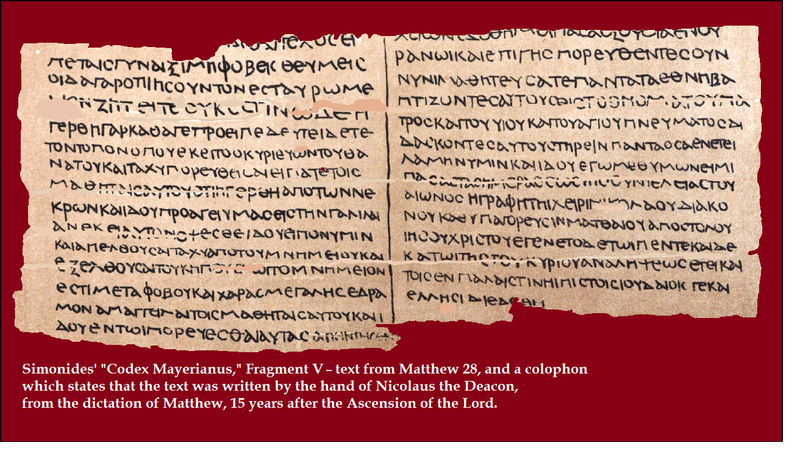 – in which an explanation is provided, with input from Jacob Peterson, of the differing tints of different sets of photographs of pages of Codex Sinaiticus. Chris Pinto’s movie Tares Among the Wheat (the second in the trilogy) strangely avoids sharing the details about how Constantine Simonides tried to defraud the Academy of Berlin, and does not go into detail about his other attempts to sell forgeries to various individuals and institutions in Europe. The movie avoids giving a detailed account of Tischendorf’s role in the events in 1856 that led to the arrest of Simonides, and thus viewers are not shown that Simonides had a strong motive to attempt to cause trouble for Tischendorf. at the World Museum in Liverpool, England. (3) a fragment of the Epistle of Jude. If anyone involved in the production of Tares Among the Wheat thinks that Constantine Simonides was not a swindler and a con artist who wrote forged texts on the blank reverse-pages of ancient papyri, then they should be clamoring for the items described by Simonides in Mayer’s personal museum (now part of the World Museum in Liverpool) to be brought to public attention and scrutinized. But if, instead, they think (as members of the Royal Society of Literature concluded in 1863) that Simonides was an educated huckster who tried to defraud German academics by doctoring ancient manuscripts, so as to make them appear to be palimpsests that contained yet more ancient writing, then they should realize that Simonides had a strong motive to try to impugn Tischendorf’s reputation – for it was Tischendorf who had stepped in and prevented the Academy of Berlin from purchasing such a forgery from Simonides. It should be noted that McKendrick’s statement is contestable; the exact point at which those book-titles were spruced up is not known; it makes sense to reckon that the letter-reinforcement throughout the manuscript, and the title-enhancements, were undertaken to make the codex look more presentable just prior to being placed in the Vatican Library, but that theory is, well, theoretical. McKendrick may also be subject to mild criticism because of his claim that Codex Sinaiticus is “The ancestor of all the Bibles that everybody else has in the world.” For those who use the King James Version or some other version based on the Textus Receptus, or based on the Byzantine Text, such a claim is entirely false. Tares Among the Wheat is three hours of anti-Jesuit propaganda, blended with KJV-Onlyist versions of selective details in the history of New Testament textual criticism. Even if the producers of this movie possessed the purest theology on earth, the fact remains that no theology is well-served by obscuring evidence and making stuff up. We should not serve it that way; we should not want to serve it that way. This movie’s conspiracy theory about Codex Sinaiticus should not be taken seriously. Simonides’ forgery of Matthew 28:6ff. (Fragment M111690.5 at the World Museum, in Liverpool). 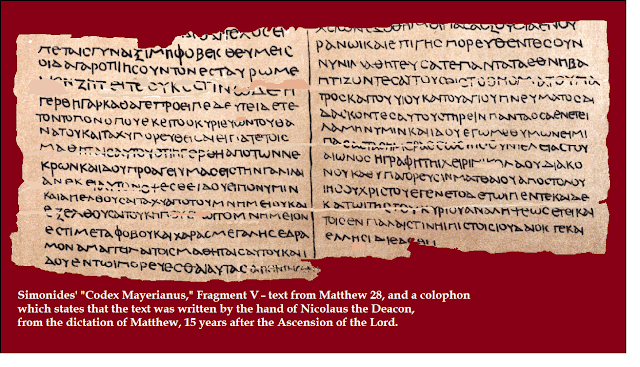 Simonides’ forgery of other parts of the Gospel of Matthew (Fragment 11169T at the World Museum, in Liverpool). Simonides’ forgery of the “Voyage of Hanno” (Fragment M11169G at the World Museum, in Liverpool). Readers are invited to double-check the data in this post. Looking at "Codex Mayerianus," I'm struck by how tightfisted the scribe was, and how regular are the boundaries of he fragment. Neither of these are typical of genuine manuscripts, whose scribes were downright prodigal with their margins--a good thing too, as most of them are gone by now. But no, this fragment has hardly any margins at all, but still 100% of the right and left margins are preserved, with room to spare--one doesn't have to know paleography, or even be able to read Greek, to judge this fragement a forgery on codicological grounds alone. This link http://www.liverpoolmuseums.org.uk/wml/collections/antiquities/ancient-egypt/item-466820.aspx?fbclid=IwAR1EIpgeLVXlvlY9APDb9tKQ56XPu3uYAMP7tp4r2vp9gXbZwy-kvQARD-0 is to a different Simonides forgery of Matthew. Note, first of all, the stingy margins, and then the incredible column length of about 60 letters. And that's only in one of the columns! People didn't have eyeglasses back then. I have trifocals, and I can barely make out any of the letters.